This entry is an effective approach to teaching economic concepts because it relies on student engagement, cooperative learning, and group interaction. This lesson plan is also an award-winning economic lesson plan as determined by the Virginia Economic Education Council in 2014. It won 3rd place in the state. It was written because of the dearth of economic lesson plans with a basis in world history. Award Letter with personal information blacked out. *Mercantilism-An economic practice adopted by European colonial powers in an effort to become self-sufficient; based on the theory that the colonies existed for the benefit of the mother country. Source: Definitions come from WHII SOL 5e or from a district-approved textbook such as: Ellis, Elisabeth and Anthony Esler. Virginia World History: The Modern Era. Pearson Education. Boston, MA: 2011. This unit will teach and reinforce the concepts by using Blooms Taxonomy, notes, direct instruction, maps, a manipulative/hands-on activity, and primary source readings. WHII-1a: The student will improve skills in historical research and geographical analysis by identifying, analyzing, and interpreting primary and secondary source sources to make generalizations about events and life in world history. *WHII-1d: The student will improve skills in historical research and geographical analysis by identifying and compare contemporary political boundaries with the locations of civilizations, empires, and kingdoms. *WHII-1e: The student will improve skills in historical research and geographical analysis by analyzing trends in human migration and cultural interaction. *WHII-5e: The student will demonstrate knowledge of the status and impact of global trade on regional civilizations of the world after 1500 A.D. (C.E.) by describing the growth of European nations, including the Commercial Revolution and mercantilism. The student will read excerpts from Nine Principle Rules of National Economy. The student will create and label features on a map relevant to mercantilism. The student will define key terms. The student will participate in a mercantilism learning activity. Material Assembly: Cut a piece a string at least 14 feet, and then tie the ends together. Make enough string so each group has one. Write “Gold” on a card, write “Resources” on a different card and, write, “Finished Goods” on a different card. Make sure each group has 15 of each. Make sure each group has at least 30 paperclips (add more if needed). Materials note: For ease of passing out, collecting-up, and re-using I give the students a manila envelope with a name of a country. Inside the envelope includes all materials needed. After the activity is over, I instruct the students to take the paperclips off the string and have them wrap the string around an included ruler. This lesson is designed for a 90-minute class; however, this lesson plan can be used as a stand-alone activity on mercantilism or part of a larger unit on the Commercial Revolution. C. Prior knowledge: The student will have prior knowledge of WHII-4a-f and WHII-5a-d.
D. Student will copy down notes from Power-point slide. E. Map: The students will complete and label the Mercantilism Map that identifies geographic features, colonies (land claims), and countries. Students will answer questions based off the map. Map is to be used with: Ellis, Elisabeth and Anthony Esler. Virginia World History: The Modern Era. Pearson Education. Boston, MA: 2011. Source of map used: Great Hall Games, http://www.greathallgames.com/acards/mapAmerica.jpg ,accessed on 4/5/2014. *If cards fall-off during the sailing they are considered to be sunk and you cannot pick them-up. *Each paperclip must contain one card. *Colonies cannot trade with other colonies. *No stealing is allowed (invariably a student will attempt to take the resources of a nearby colony. Debrief question #7 touches upon this issue). *Piracy: I tell my students that there is a pirate sailing the ocean. I normally act as the pirate and attempt to take any nation’s cards. Though, you could select a responsible student. -String Controller-Parent Country. Controls the operation of the string for the parent country. -Port Inspector-Parent Country. Responsible for clipping and unclipping cards for the parent country. -String Controller-Colony. Controls the operation of the string for the colony. -Port Inspector-Colony. Responsible for clipping and unclipping cards for colony. Role Note: If you have odd-group numbers, consider a deputy port inspector for either the parent country or colony who can help with the clipping and unclipping. 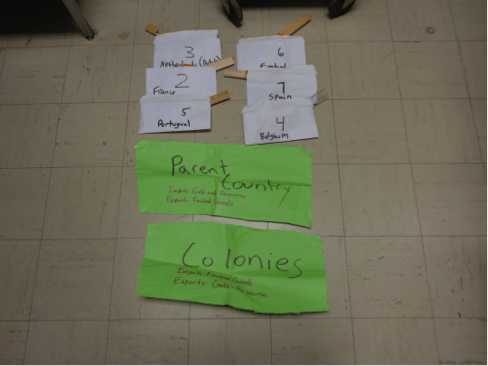 After roles are selected, I instruct the Colonies to stand at the side of the room labeled “Colonies” and the mother countries to stand at the side of the room labeled “Mother Country.” Have the respective colonies and mother countries face each other and spread the string across the room so that each nation is connected (via) the string to their colony. Ensure that the colonies have “Gold” and “Resource” cards and that the mother country has “Finished Goods” cards. Note: Have each group do a practice run first so they understand how to move the string in unison. After a practice round begin the string relay-race. What were some of the problems faced with getting trade across the Atlantic? What did the colonies have that the parent countries wanted? A. What did the parent country sell back to the colonies? A. Who benefits more by this system, the Colonies or the Parent country? A. How might the colonies feel about this system? What do you think is the parent countries biggest concern? How might mercantilism and cross-Atlantic trade led to war? How is the Commercial Revolution related to mercantilism? Mother country could try to take over a different colony; nations might get blamed for piracy. The Commercial Revolution allowed for the creation of Mercantilism so parent countries could get richer and try to out-compete their rivals. Working independently: Have students complete the Nine Principal Rules of National Economy handout and/or the Mercantilism Scenarios. For Nine Principal Rules of National Economy and Mercantilism Scenarios source text see: Campbell, Melissa, Christine Colihan, Cristina Kalesse, and Amy Vitcusky. Unit Title: Mercantilism and Colonial America. University of Delaware, Historical Literacy Project. 5 March, 2009. H. Independent Practice: Students will read the primary source document Nine Principle Rules of National Economy and complete the summery chart. Teachers may want to consider doing the first two readings as a class for guided practice and than have the students complete the rest. To involve cross-literacy and historical text skills, students might be instructed to highlight and define words that the do not know using a computer or a dictionary. I. Independent Practice: Students will apply what they know about mercantilism and complete Mercantilism Scenarios. Teachers may want to consider doing the first two scenarios as guided practice. To involve cross-literacy and historical text skills, students might be instructed to highlight and define words that the do not know using a computer or a dictionary. J. Homework: Assign a relevant chapter in the textbook to read or instruct students to finish independent work at home. During the 2013-2014 academic year, 130 mixed-ability students on the First 9 weeks Benchmark Test had a 75.8% pass-rate for questions related to WHII 5e: Global Trade and Mercantilism. Hampton City Schools as a district had a pass-rate of 67.4% for same question during the same year. During the 2012-2013 school year, 120 mixed ability students on the first 9 weeks Benchmark Test had an 83% pass-rate, while the Hampton City School District had a 63.4% question pass-rate for SOL 5e. Note: To download the lesson plan you will need an unzipping program.